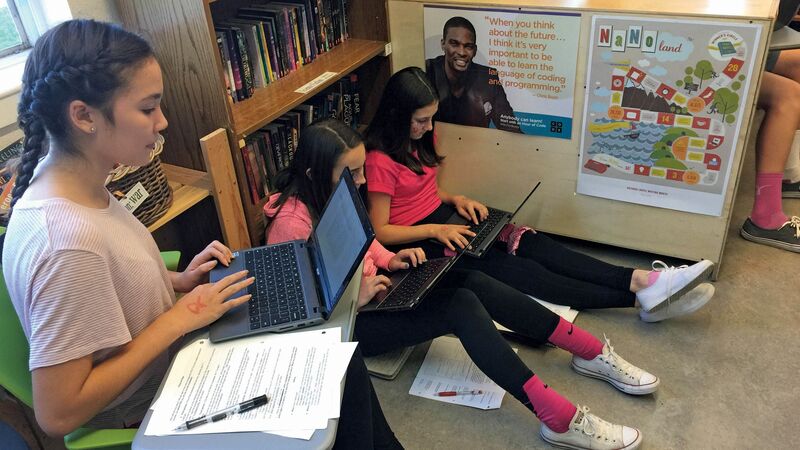 Eighth-grade students in Laura Bradley’s flexible classroom make themselves comfortable to work. I was already experimenting with flexible seating in my eighth-grade English classroom when I saw a video about combating writer’s block by working in a box castle. We don’t have room for cardboard castles, but I could string up “box castle lights” and let students rearrange the furniture into writing forts. My students loved it! They turned tables upside down, built forts with their chairs, grabbed carpet squares to sit on, and settled in to write for a solid hour. They happily cleaned it up at the end of class and repeated the process every extended writing time. The next year my district made a commitment to flexible seating by equipping every classroom with seating options and chairs on wheels. Flexible seating can add a wrinkle to classroom management, but with careful planning and clear expectations, our students will rise to the occasion and use flexible seating to improve their own learning environment. Here are the ways I’ve addressed classroom management in a flexible classroom. My students start each class period in assigned seats arranged in rows facing the front so that I can take attendance, go over the agenda, announce the homework, and take care of any direct instruction. With classes of students coming and going all day, the seating chart provides a smooth start for each group. Even if you teach in a self-contained classroom and can easily take roll no matter where your students are seated, I encourage you to have seating charts so that when you’re not there, your students will be familiar with the seating expectation and your substitute will know who’s who. Assigned seats also address what is often an invisible issue for many students: the social anxiety that comes with entering a room and not knowing where to sit. Where are my friends? Who will let me sit next to them? Where is that kid who keeps teasing me? After our start-of-class routine, students may move their desks (or move to a different kind of workspace) in order to work where they are most comfortable and productive. Often they have the option of working with other students. This flexibility includes being able to move again if their current location isn’t working for them. You may allow students to use headphones to listen to music while they work (to block out distractions). With teacher direction, they may move to specified options. With teacher direction, they may work with/talk to others as they work. During work time, they may move to better environments for them. If they are disruptive or not working, they may be moved to a new location. There are times when we have to go back and revisit the expectations and sometimes make modifications. For instance, I noticed that students would roll their desks back against a wall where I couldn’t see their screens. I didn’t want to assume they were off-task, but I also couldn’t help them with their work if I couldn’t see their screens. So we added the rule that if they were working on devices, they needed to be seated in a way that I could see their screens. A fun way to train students to move seats into various configurations is with Desk Olympics. Furniture on wheels makes it easier to move from rows to partners to groups to a whole-class discussion circle, but those transitions can be noisy and time-consuming. We practice moving into the different formations, racing against the clock to see how fast we can finish. Extra points for silence!